Are you in love with The Feldenkrais Method? I am and I love the quotes by Moshé Feldenkrais too. 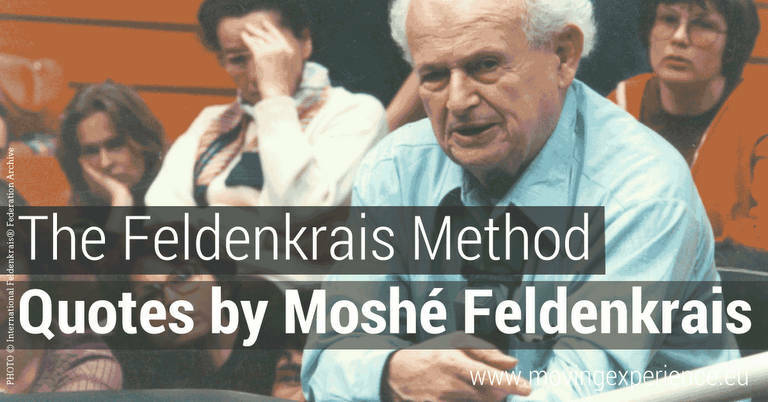 Moshé Feldenkrais has come up with a lot of brilliant material for thought and practice. With remarkable quotes. See the list below. The Feldenkrais Method gains publicity and more and more practitioners worldwide offering Awareness Through Movement classes and Functional Integration lessons. If you are a practitioner yourself and have a blog with quotes by Moshé Feldenkrais I am happy to link to it in exchange for a back link and a LIKE on Facebook (Moving Experience). Thank you in advance. The following quotes are from the Awareness Through Movement lessons by Moshé Feldenkrais. I stumbled upon them while preparing for my own ATM classes or when joining the An AY a Day lessons. You might find them as enlightening as I do. Your Favourite Quote Is Missing? Is your favourite quote by Moshè Feldenkrais missing? Have you created your own blog post with quotes by him and would like me to add it to this list? Ist deine Lieblingzitat von Moshè Feldenkrais noch nicht auf dieser Liste vertreten? Hast Du vielleicht selber eine Blog Post mit Deinen Favoritzitaten und möchtest gerne verlinkt werden?